I have always been one to wait and buy a tool when I can find it on sale. Why pay full price when you don't have too? 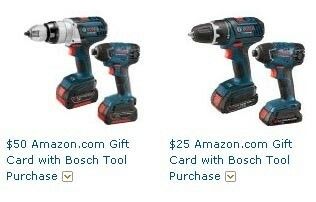 If you too like a good sale, now might be the right time for you to buy some Bosch tools. Amazon is running a promotion until September 15th that gives you back either a $25 or $50 Amazon gift card depending on the Bosch tool or combo set that you buy. Just add both to your shopping cart and the gift card will show up as free when you go to check out. Obviously some of the deals might be better than others, so if you see a tool or set that you like, I suggest you shop the model number around. Tools/Sets eligible for a $25 gift card. Tools/Sets eligible for a $50 gift card.